I purchased a used sport 1100i with the motor disassembled. 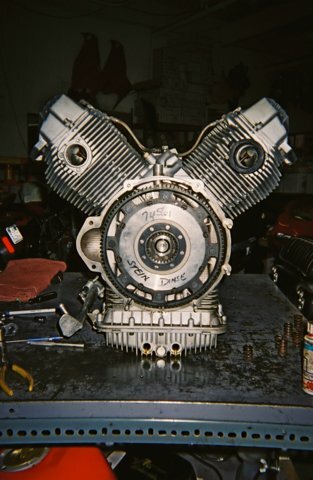 Previous owner (PO) was going to have GP in San Diego reassemble with a Dynotec big bore kit- then changed his mind and traded the bike (already disassembled) in on an Aprillia. Paul gave me a deal on the bike including re-assembly. Not bright enough to leave well enough alone, I decided since it's already apart why not massage it just a little. Talked to Manfred Hecht and said I wanted a cam that operated within the factory rev limits but was more aggressive (more lift - more duration) while still streetable. He recommended the Megacycle RR3 cam. Asked him what kind of HP I could expect and he said low 90s. With that as background, here's what's been done. Heads were shipped to Manfred. He recessed the valve pockets to accommodate greater lift of RR3 cam. Crank (stock), pistons (stock) and rods (Carillo – not necessary since red line only 8000, but PO had ordered them and they were still there so Paul gave me a deal on them) were sent to Falicon for balancing. Air box removed and replaced with K&N pods. PO had already installed a full Staintune sport exhaust and Creedon chip and they remained. PO had had bike prior to disassembly on that Dyno, though don't know if with or without Staintunes - but otherwise stock except for Creedon chip. Map still in the Dyno and showed 80 peak HP. After reassembled with mods described above and with Creedon chip still in bike it ran so poorly I purchased an FIM chip. We were able to tweak it to at least be rideable. I put it on the dyno with FIM chip installed and it developed 89 peak HP. In desperation due to continuing drivability problems, I found a Ducati race tuner with software, sniffer and data logger who was willing to custom build a map. He used a Ducati FIM chip and flashed a Guzzi map on it, then tweaked it. Much better drivability. Brief summary: PO's bike generated 80 HP with Creedons chip and Staintune exhaust. RR3 cam, K&N pods and FIM chip yielded 89 HP. Custom chip yielded 93 HP on a Dynojet 150 inertia dyno. The DynoJet graph shows the three results I've described above - stock, FIM chipped, and custom chipped. Heads sent to Stein-Dinse for twin plugging, decking (11.5x1 CR calculated) and some minimal grinding near the exhaust header pipe connection point to eliminate a ridge that all those castings seem to have. No flow bench work. New chip flashed - only change was reduction of maximum advance to 28 degrees. Results - strictly seat of the pants at this point since haven't run on dyno due to marginal clutch. Much better driveability. Idles better (go figure) and seems to have filled in the mid range nicely. When new clutch plates and lightened flywheel arrive I will Dyno again in current configuration. Assuming the clutch holds for that last run should be able to see just what the twin plugs/ retarded timing/ enhanced compression have yielded. I'll update you with a new graph once that happens. NEW Dyno results for my PCIII'ed / Twin-plug / Retarded timing chip and increased CR. Hope this makes sense... what I've written, that is. Not even going to pretend that this ordeal made any sense in retrospect. <g> See the motor on the bench.